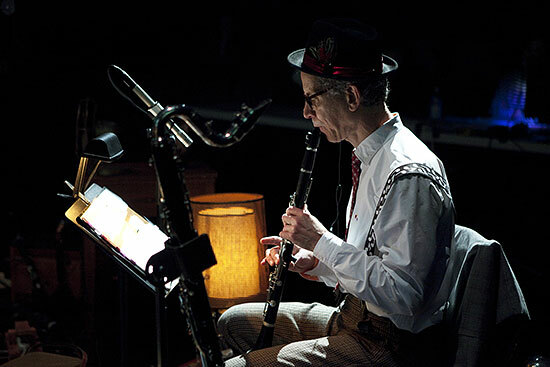 Clarinetist, composer, and arranger Andy Biskin (born 1955 in San Antonio, Texas) is a true musical adventurer. A student of music and anthropology at Yale University, one of his first jobs out of college was as assistant to folklorist Alan Lomax whose work cataloging and recording American "folk" music, an endeavor started by his father John, led to better understanding how American music became American. 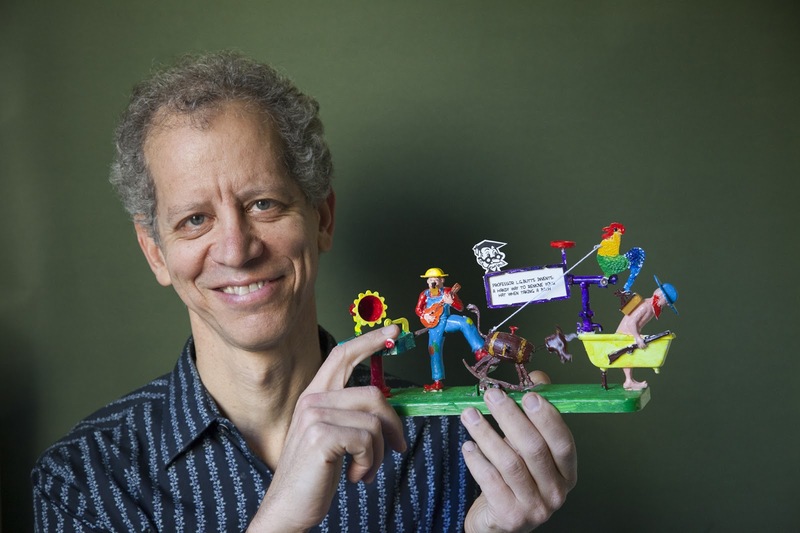 As a youngster, Biskin heard all types of music in Texas, from Mexican conjuntos to German Polkas to Dixieland Bands to symphonies. Over the past four decades, Biskin has worked as a video editor, documentary maker, and, starting in 2001, has released five recordings as a leader or co-leader. You'll hear echoes of Charles Ives, Aaron Copland, Louis Armstrong, Duke Ellington, blues, jazz, swing, marching band tunes, and so much more. Biskin must have had so much fun with his arrangements. The album opener, "Sweet Betsy From Pike", opens with each trumpeter taking his turn to play the melody and only near the end does the bass clarinet add his voice to the short section in which the three trumpets play together. "Grey Goose" hits hard with the drummer leading the charge. Rob Garcia is an inspired choice for this ensemble. Having played numerous styes of music (from big band to early jazz to his own modern quintet and more), he always makes the right moves either leading the quintet forward or in support. Garcia pushes the group through a funky, spirited, take of "Knock John Booker" (Biskin's bass clarinet part has echoes of David Murray's work with the World Saxophone Quartet, especially on "Steppin'"). So many highlights throughout the album. The 1817 gospel tune "Am I Born To Die" has a haunting melody, lovely harmonies, and a martial beat that links it to the early days of the American republic. The plaintive melody of "House Carpenter" starts slowly but the middle section "rocks out" for a few moments around solo clarinet melodic fills. "Down in the Valley" has moments that sound like Copland's "Appalachian Spring"; the splay and trills of the muted trumpets, Biskin's mournful clarinet, and Garcia's strong brushes and bass drum work stand out. "Tom Dooley" is a bouncy piece considering the sadness of the story. Here the song moves with great spirit. 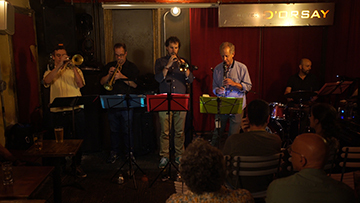 "16 Tons" closes with a solo clarinet reprise of "Sweet Betsy From Bike", a gentle send-off to an album that is full of splendid performances, humor, emotion, melodies, harmonies, and fascinating rhythms. Actually, the one thing the album does not have is the title song (possibly because the song we know as "16 Tons" was composed in 1950 by Merle Travis - there are people who say the song comes from the 1930s). That's no problem, really. 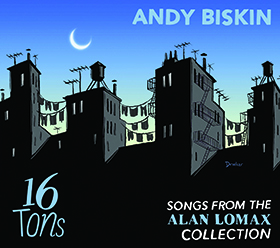 Andy Biskin continues to create music that, even as it embraces its roots, pushes against convention and cliche. 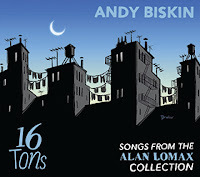 For more information, go to www.andybiskin.com. The 20th Century has been called the "American Century" because of all the trials, tribulations, innovations, the Depression, World Wars, the Vietnam War, the end of Communism in Eastern Europe, and so on. American music absorbed the sounds and poetry of the country's inhabitants, whether it was the Broadway Dreams of the Gershwin Brothers, Irving Berlin, and Rodgers & Hammerstein or the songs and sound of Louis Armstrong, Duke Ellington, Woody Guthrie, Hank Williams, Elvis Presley, Allen Touissaint, Motown, Michael Jackson, and others. Classical music innovators include George Gershwin, Aaron Copland, Steve Reich, Phillip Glass, John Harbison, and Leonard Bernstein. Bernstein (1918-1990) drew from so many influences and broke down so many walls that people continue to study and perform his music, watch his lectures, and buy his recordings. 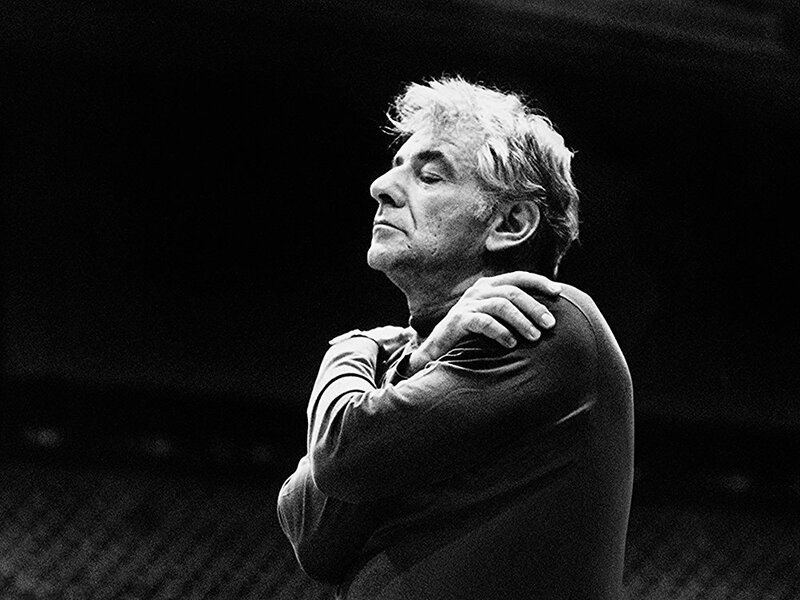 Bernstein composed the music for six Broadway musicals, from 1944's boisterous "On The Town", 1956's comic satire "Candide", and his one giant mistake, 1976's "1600 Pennsylvania Avenue" (with lyrics by Alan J. Lerner). His most famous work is, arguably, 1957's "West Side Story" (lyrics by Stephen Sondheim), an adaptation of William Shakespeare's "Romeo & Juliet" set in New York City in the wave of Puerto Rican immigration. The story aside, the music is extremely adventurous with rhythms coming at the listener/audience from all sides. 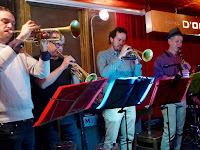 Jazz musicians have taken up the challenge of playing this music with artists such as pianists Bill Charlap, Tommy Flanagan, and Oscar Peterson recording all or some of the material from the production. Stan Kenton's Orchestra released a memorable version on the early 1960s as did saxophonist Bill Barron (1963). 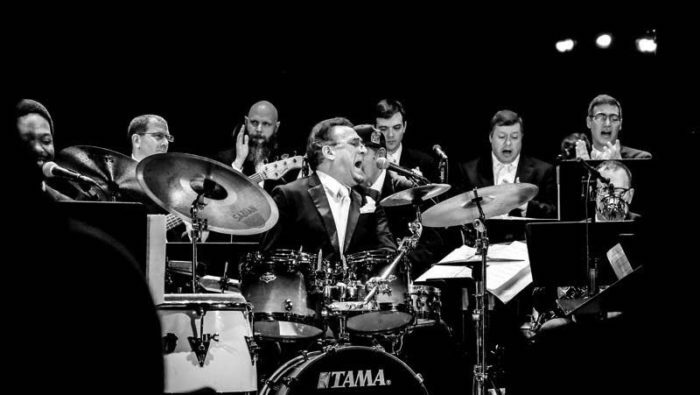 To celebrate Maestro Bernstein's 100th Birthday, drummer Bobby Sanabria decided to record the score with his Multiverse Big Band. The results, recorded in December of 2017 at Dizzy's Club Coca Cola for Jazz at Lincoln Center, can be heard on the dynamic new "West Side Story: Reimagined" (Jazzheads Records). Sanabria's faculty mate at the Manhattan School of Music, Jeremy Fletcher, contributed five of the arrangements along with arrangers that former MSM students, band members, and friends such as baritone saxophonist Danny Rivera, Niko Siebold, Jeff Lederer, Matt Wong, Nate Sparks, Eugene Marlow, Andrew Neesley, and percussionist Takao Heisho. Over the two hours of music, the 21-member Multiverse Big Band (personnel below) handles the material with aplomb. Not surprising that the rhythm sections almost always leads the way through the songs. The first of the two CDs bursts right out of the starting gate with "Prologue" (an overture), "Jet Song", "America", and "Gee, Officer Krupke" only slowing down for the lovely "Tonight." The first side closes with two "Gym Scenes" both utilizing the melody of "Maria" played as a blues and a mambo on the first cut and as a Cha Cha Cha on the second. Side two opens with a full version of "Maria" arranged by Sanabria's musical associate Eugene Marlow. It's a fascinating version. Opening with an Yoruban chant featuring drums and voices that lead into the memorable melody (brilliantly played by the trumpets), the piece soon moves into another percussion & voice interaction that reaches a frenzied climax before returning to the melody. "Cool" and "The Rumble" raises the temperature back to a boiling point - it's easy to lose one's breath keeping up with these frenetic performances. The arrangements of "One Hand, One Heart" and "Somewhere", both dramatic ballads, also are built on rhythms that may surprise lovers of the originals. The former features a lovely samba rhythm with trombonist Armando Vergara and alto saxophonist David Dejesus representing the star-crossed lovers Tony and Maria. The piece breaks out into a joyous strut for the fine flute solo by Gabrielle Garo. The latter tune is taken at more of break-neck speed, slowing down for the delightful melody. The lovely tune almost gets lost in the fiery rhythms. The "Epilogue/Finale", coming after an emotional speech by Sanabria, also uses the melody of "Somewhere" , taken slower here but with a rubato "free" section to use sounds to illustrate Maria's sense of loss. I have to admit it took me a while to really see the brilliance of "West Side Story: Reimagined" as I missed the sassy lyrics of "America" and "Gee, Officer Krupke" as well as the lovely sentiments of "Somewhere" and "One Hand, One Heart." Yet, play this music good and loud, let the trumpets and trombones bore a hole in your soul, the reeds rise above the fray, and the percussion guide your feet, you'll soon be seduced by these delightful performances. You know that Leonard Bernstein, such a champion of all kinds of music, a man with empathy for all people, would be charmed and thrilled! 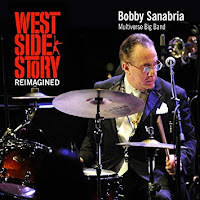 Bravo Señor Bobby Sanabria! 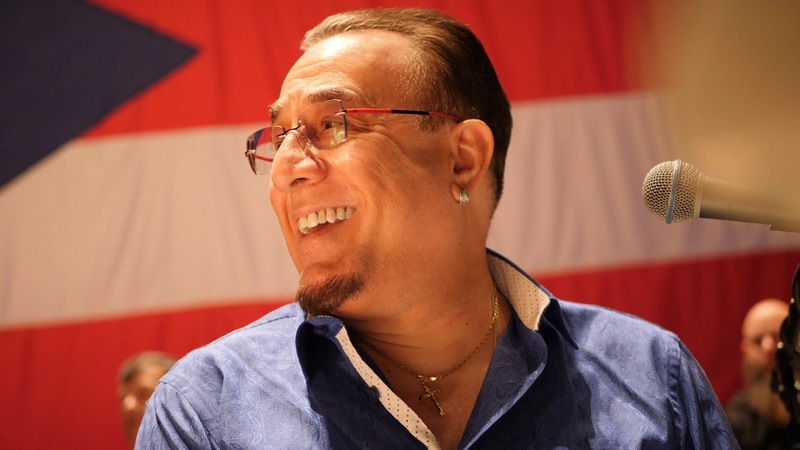 To find out more, go to www.bobbysanabria.com. 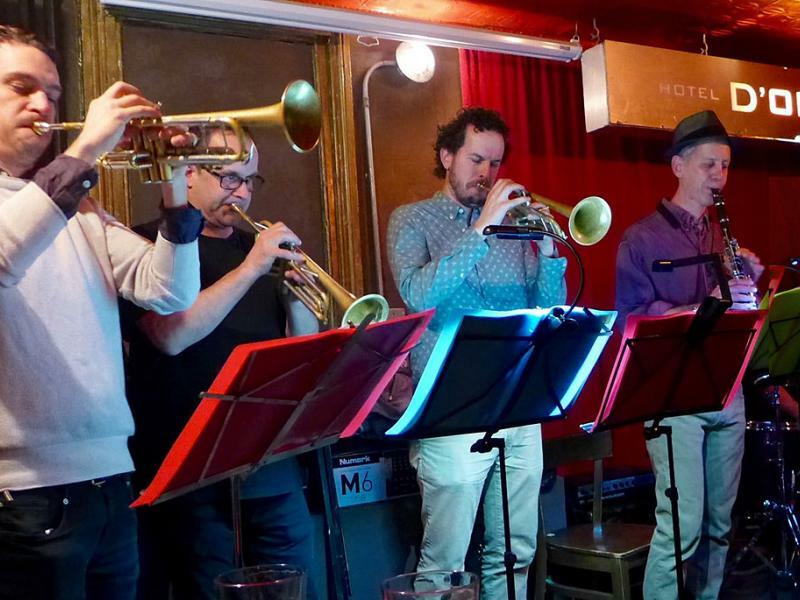 Trumpets: Kevin Bryan (lead, opening whistle), Shareef Clayton, Max Darché, Andrew Neesley. Saxophones: David Dejesus: lead alto and soprano, flute; Andrew Gould: alto and flute; Peter Brainin: tenor and flute; Yaacov Mayman: tenor, flute and clarinet; Danny Rivera: baritone. Takeo Heisho: claves, Cuban güiro macho, cencerro, Puerto Rican guicharo, okonkolo batá drum, maracas (Cuban and Venezuelan), shekere, tamborine, cuica, pandeiro, triangle, gong and police siren.